I’m Wonder Woman. You have asked Wonder Woman to be your wife. Don’t freak out. It's not like there weren't signs. Remember how when I met your family, and your sister was so impressed with me? She was all like "Oh Diana, you astound me, I just don't know how you do it all. You must be a Superwoman." And I was like "That's because I am one!" And we laughed, hahahahaha. Well, it's not a joke. I am a Superwoman. Literally. I know, it’s a lot to take in. I’m an Amazonian princess with superhuman powers and superior combat skills. Here sit down, honey. I don’t want you to feel like I’m not the same girl you fell in love with. It’s still me. I'm still the same sweet, well mannered young woman that enjoys cuddling up by the fire with a book and a cup of chamomile. Speaking of tea, do you need a cup? You look a little pale. There's nothing to be afraid of. But you should also know that I maintain a large arsenal of weapons, have an invisible airplane, and a tiara that I can shoot off my head like a projectile. Here just breath into this paper bag. Slow deep breaths. That's it. This is good ... you’re still conscious. It's unusual. At this point, every other guy I’ve dated has passed out, well one wet himself, one made a run for it. But ... but you’re...you’re different, aren’t you? Remember our first date, when you told me about your year after college with AmeriCorps? Traveling the world helping those in need? It reminded me of myself. After college I travelled the world helping people too! Granted it was with The Justice League of America, not other recent college grads. But they acted immature. Superman was always showing off, like "Hey look babe, I'm actually moving a mountain for you" and Aquaman was always all like "Hey babe, I'll die if you don't come swimming with me." Granted he actually will die if he's out if the water for more than an hour but he was always milking it. I just want a nice, humble, normal guy...I want you! But ... I want you to go in with your eyes wide open. You need to understand, my job takes its toll. I’m often in a bitchy mood after battling mythological monsters or toppling fascist regimes. And I can’t be defined by a man, I’m a feminist, big time. I believe women should be empowered and whenever possible super powered. Look, I’m sorry I kept my secret identity from you. It’s really a necessity to give me some downtime from all the supervillains and paparazzi. But I promise, from now on, if you still want to do this ... there won’t be any secrets between us. I’ll never keep anything from you, and I’m certain you’ll be totally honest with me. Literally 100% certain. 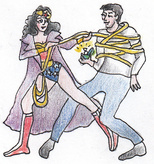 I have a golden magic lasso of truth. So … on that note … moment of truth. (she lassoes him) Do you still want to marry me? You're uncertain ... I ... I appreciate your honesty. Listen, it's true I'm Wonder Woman, I'm Superhuman and can deflect bullets with my bracelets. But I'm also just a girl standing in front of a boy asking him to love her. Yes, I stole that line from Notting Hill. But that doesn't make it any less true. You're my weakness, Bob. Well, what do you say? I can't promise you a normal life, but I can give you a super one. Oh, did you fall off your chair? You didn't you're on your knee on purpose! Oh my, oh my! Yes!!! Yes!! Yes Bob I'll be your wife!!! Oh you've made me the happiest Wonder Woman in the world.